This entry was posted in flimsy, table toppers by Norma Hanson. Bookmark the permalink. Oh I love the way you think, Norma! Heck yes, strike this stuff off the quilting bucket list. I can see where the 60 degrees stuff could be maddening but add the poor instructions etc to the top of that—oh my! It IS cute and with all that busy watermelon fabric how would you know if the stuff may not quite match. IIWII, right? Stick something on top of it on the table and you won’t see the center or whatever is bothering you about it much. Surely you weren’t making 3 of these with that pattern? 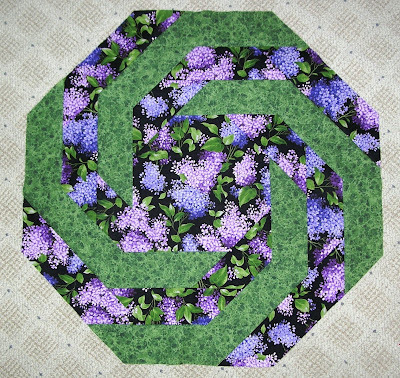 Lilacs are one of my fav flowers and the table topper is so pretty. as you all know … I will have no problem finding this table topper a home. 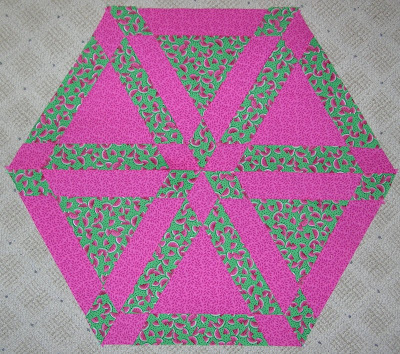 Just did a websearch for “spiral table topper pattern” and came across this post. Do you know where I can track down a copy of the pattern for this spiral table topper? I’d like to give this design a try.